"A 'universal,' to philosophy, is our conceptual categorization of a thing. Is there, for example, such a thing as Apple? We know the things so categorized... But does Apple have a real existence? Occam said no, won the debate, and put Western Civilization into reverse gear... It is very difficult to see where [Occam] erred.... The mistake was incredibly subtle. To deny 'Apple' is, in the end, to deny the reality of human concepts. It is to deny the workings of the human mind..."
Sounds suspiciously similar to Rand. Is this perhaps by one of her less orthodox followers? No, not at all. It's by George Roche, former President of Hillsdale College and someone who despised and probably never read Rand. So where did Roche get this notion that the ills of Western Civilization can be traced to the philosophical issue of universals? Roche's source is Richard Weaver's book Ideas Have Consequences, published in 1949. Is it possible that Rand's original inspiration for blaming the problem of universals for crisis of Western Civilization also came from the same source? But where else could it have come from? Rand is not known to have been widely read in philosophy. She only, we have been told, read synopses. She was, it is true, a history major, but she got her degree at a Soviet University, and if her philosophical writings are any indication, she does not appear to have had more than a superficial knowledge of history. So once more the question arises: where else but from Weaver could she have gotten her odd notions about the problem of universals? It is entirely conceivable that one of her conservative acquaintences brought up the Weaver's thesis during one of Rand's intellectual bull sessions; that from hence, Rand absorbed the thesis and integrated it into her own philosophy, altering it somewhat in the process but not substantially changing it; and then she introduced it to the world in her essay "For the New Intellectual," published in 1961. Weaver's thesis clearly would have appealed to Rand, because it gives importance to an issue that hardly anyone has cared about since the age of scholasticism, when the philosophy of Aristotle, Rand's master of masters, dominated the intellectual scene. Understanding Objectivist Jargon Pt 10: "Anti-concept"
"Anti-concept" = any vague, confusing or poorly defined term. Which would include the term "anti-concept" itself. 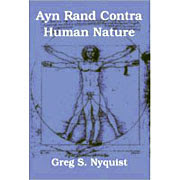 More simply, any concept Ayn Rand was anti. Where did Rand pick up the notion that Kant's philosophical aim was to destroy reason to make way for faith and mysticism? Given that Rand probably never read Kant and that what she wrote about Kant has been refuted several times by two of her admirers (Walsh and Seddon), how can we account for Rand's declaration that Kant is the "man who closed the door of philosophy to reason"? Kant, it is true, did admit in the preface to the second edition of the Critique of Reason that "we have to deny knowledge to make room for faith." But this is hardly the equivalent of full-fledged attack on man's conceptual faculty. Where, then, did Rand get the idea that not merely Kant, but his critical philosophy, is opposed to reason? One possibility is Chapter 4 of George Santayana's Reason in Common Sense. While it is unlikely that Rand ever read Santayana, she may have got Santayana's take on Kant second-hand through someone who had read him. Of all the major philosophers that came before Rand, Santayana's view of Kant comes closest to Rand. "Kant," writes Santayana, "had a private mysticism in reserve to raise upon the ruins of science and common-sense. Knowledge was to be removed to make way for faith." Santayana contended that there lurked a "sinister intention" in Kant's substitution of faith for knowledge. "[Kant] wished to blast as insignificant, because 'subjective,' the whole structure of human intelligence, with all the lessons of experience and all the triumphs of human skill, and to attach absolute validity instead to certain echoes of his rigoristic religious education.... Nature had been proved a figment of human imagination so that, once rid of all but a mock allegiance to her facts and laws, we might be free to invent any world we chose and believe it to be absolutely real and independent of nature. Strange prepossession, that while part of human life and mind was to be an avenue to reality and to put men in relation to external and eternal things, the whole of human life and mind should not be able to do so!" As for Kant's morality, Santayana regarded it as a "personal superstition, irrelevant to the impulse and need of the world. [Kant's] notions of the supernatural were those of his sect and generation, and did not pass to his more influential disciples; what was transmitted was simply the contempt for sense and understanding and the practice, authorized by his modest example, of building air-castles in the great clearing which the Critique was supposed to have made." Rand would have agreed with virtually everything in Santayana's critique, particularly about Kant's motivation, except that she would have wished to translate it into her own strange philosophical terms. Kant, she argued, invalidated man's knowledge on the grounds that man's "consciousness possesses identity." This is intolerably vague. How much better is Santayana when he writes: "Conceptions rooted in the very elements of our being, in our sense, intellect, and imagination, which had shaped themselves through many generations under a constant fire of observation and disillusion, these were to be called subjective, not only in the sense in which all knowledge must obviously be so, since it is knowledge that someone possesses and has gained, but subjective in a disparaging sense, and in contrast to some better form of knowledge. But what better form of knowledge is this? If it be knowledge of things as they really are and not as they appear, we must remember that reality means what the intellect infers from the data of sense; and yet the principles of such inference, by which the distinction between appearance and reality is first instituted, are precisely the principles now to be discarded as subjective and of merely empirical validity." And so from this, we can make a generalization which will help place Rand's achievement as a philosopher in proper perspective. You take almost any position that Rand holds, whether good, bad, or indifferent, and you'll find that position more ably supported by someone else. Dragonfly: Peikoff also argues that scientific theories are influenced by bad philosophy. He mentions Heisenberg's uncertainty relation as an example. No doubt no such thing would exist in Objectivist physics! Further he writes: "Even the professional mathematicians, the onetime guardians of the citadel of certainty and of logical consistency, caught the hang of the modern spirit. In 1931, they were apprised of the latest Viennese development in the field, Kurt Gödel's incompleteness theorem, according to which logical consistency (and therefore certainty) is precisely the attribute that no systems of mathematics can ever claim to possess." Really a strange version of Gödel's theorem! No doubt Objectivists can point out the error in Gödel's proof? As in his DIMwit lectures, Peikoff uses as reference for his scientific insights the well-known scientific publication The New York Times. The following observation is also interesting: "Decades ago, the exponents of purposefully guided, objective cognition - which is what scientists had once been - began yielding to two newer breeds: the narrow technicians and the punch-drunk theoreticians. The former are intent on amassing disconnected bits of experimental data, with no clear idea of context, wider meaning, or overall cognitive goal. [Really, Doctor Peikoff? How do you know? Where is your evidence?] The latter - trained in a Kantian skepticism by Dewey, Carnap, Heisenberg, Gödel and many others - turn out increasingly arbitrary speculations while stressing the power of physical theory; not its power to advance man's confidence or make reality intelligible, but to achieve the opposite results. Quantum mechanics, the theoreticians started to say, refutes causality, light waves refute logic [I wonder how they do that? ], relativity refutes common sense [and therefore it must be wrong? ], thermodynamics refutes hope [??? ], scientific law is old-fashioned, explanation is impossible, electrons are a myth [where did he get that notion? ], mathematics is a game, the difference between physics and religion is only a matter of taste [it is at least bigger than the difference between Objectivism and religion]. Sometimes you can hear some of the less orthodox Objectivists whisper that Peikoff now has lost his marbles, but that he has been so brilliant in the past. Well, it seems he lost his marbles already 25 years ago. Perhaps he has never had any marbles! As elucidated in an earlier posting, it had become fairly common during the thirties and forties to blame the rise of German statism on German philosophy. "The popularity of the opinion that German nationalism is the outcome of ideas of German philosophy is mainly due to the authority of George Santayana," wrote Ludwig von Mises in 1940. There is a problem, however, with this view of the matter. Santayana never actually claimed that German idealism logically brought about (or caused) German nationalism and Hitlerism. His claim was much more modest. He believed that German nationalism and German philosophy were both expressions of the German character, so that philosophy, far from being a cause or a logical precondition, was merely a symptom. But conservative intellectuals were eager to blame German idealism, which they despised, for German aggression; and so they assumed as Mises assumed. Santayana's book Egotism in German Philosophy , originally published in 1915, was seen as a prophetic explanation of the rise of militarism and Nazism in Germany. Of course, it was no such thing, but once the notion had entered the intellectual culture, there was no getting it out. In 1943, Hayek published Road to Serfdom, which was the first book to popularize the idea that there existed parallels between what had happened in Germany around the turn of the century and what was happening in England and America during the thirties. Hayek's book focused almost exclusively on politics and economics; he did not try to put the finger of blame on German idealism. His friend Karl Popper, however, once more played the German Idealism card in the second volume of his The Open Society and its Enemies, which focused on the deleterious influence of Hegel. Popper's book was published in 1945. The Anglo-American intellectual milieu had undergone a transformation in the thirties. Nazism had forced many of central Europe's most important and influential scholars and intellectuals to emigrate to England or America. Many of these expatriated scholars and intellectuals had studied Hegel under the most advanced Hegelian scholars in the world, and they simply could not accept Popper's view of Hegel as the forerunner of German totalitarianism. There was something of a critical backlash inspired by Popper's Open Society that marks the waning of the view that German idealism caused the rise of Hitler and the Nazis. By the time Peikoff, under the direct tutelage of Rand, began embalming the notion in his book The Ominous Parallels, it had become largely discredited. Extensive research in pyschology, sociology, and history all demonstrated that social change was not determined by abstract philosophy. The belief in the simple causation between philosophical doctrine on the on hand and social crisis on the other belongs to a less sophisticated intellectual milieu. The trouble with Objectivism, particularly in its ARI manifestations, is that it seems trapped in a kind of time warp: its main notions have their source in ideas Rand was exposed to in the conservative circles she travelled in during the thirties and forties. By the fifties, Rand rarely ventured outside her own hermetically sealed circle of young Objectivist enthusiasts (the "collective"). She knew little--and evinced hardly any interest at all--in developments in cognitive science, psychiatry, neuroscience, historical scholarship, and philosophical scholarship. Peikoff's The Ominous Parallels has its roots in a very shallow, intellectually impoverished soil. It stems from misrepresentations and over-simplifications of the works of Santayana, Hayek, Popper and a few others, as filtered through the unsophisticated conservative intellectuals of the thirties and forties. Despite Ayn Rand’s obvious importance both as a controversial polemicist and as an American cultural figure, her philosophy of Objectivism has largely escaped the scrutiny of a genuinely intelligent and penetrating criticism. While Objectivists ascribe this to the soundness and irrefutability of Rand’s ideas, in fact Rand was a surprisingly sloppy and maladroit thinker, some of whose most important doctrines are based on little more than a play on words. Even when her conclusions are correct, she is often right for the wrong reasons. As a result, there is quite a bit of truth to Objectivism, but it is so inextricably mixed with falsehoods and errors that it is in many respects a compendium of half-truths. Nonetheless, despite her non sequiturs, over-generalisations, incompetent formulations, pseudo-empirical references, and other bunglings, she should still be regarded as an important, and even great thinker. Many far more famous philosophers made equally egregious errors. Rand was a brilliant polemicist and ingenious sophist; hence while her takes on issues from the problem of abortion to the problem of universals often sounded persuasive, they often concealed numerous logical and empirical shortcomings. I believe that Rand is either wrong or confused about many of the central issues of philosophy. She is wrong about the nature of man, the role of philosophy in history, about the validity of induction, about the absolute objectivity of values, about the feasibility of laissez-faire capitalism, and about the nature of romanticism; and she is confused about philosophical idealism, consciousness, the relation between ideas and things, the psychology of altruism. ARCHN sets out to criticize Rand from both an empirical and a logical point of view. While Objectivism officially adopts the view that all knowledge comes from experience, I will argue that in fact it operates in a highly rationalistic fashion, deliberately avoiding empirical reality and seeking to reduce the universe to a handful of rhetorical constructions. "For the most part, (Rand's) theory of essence is merely a justification for arbitrarily ignoring any characteristics found in reality that contradicted Rand's theories." 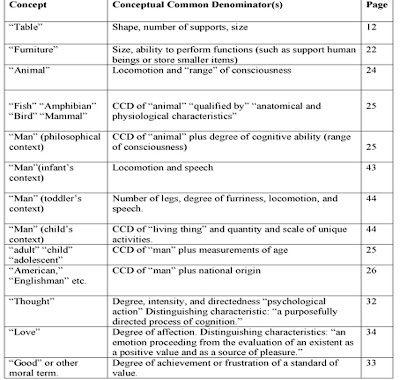 Understanding Objectivist Jargon Pt 9: "Conceptual Common Denominator"
The "Conceptual Common Denominator" or "CCD" is surely one of the wooliest terms in the vast sheep station of Objectivist jargon, and is central to Rand's much hyped theory of Concept Formation. However, shorn of its typical verbiage, it merely means something one object has in common with another, or a similarity. The problem is, of course, that Rand's theory is supposed to solve the age-old problem of universals, or why different things are similar. Her answer appears to be because they have one or more "Conceptual Common Denominators" ie: similarities. So, in classic Randian style, her astonishing answer to the problem of why different things are similar, is...because they have similarities! William Thomas of The Objectivist Centre is a brave man. Towards the end of this short summary of Rand's theory, he makes a rare effort to actually give some specific examples of Rand's "CCDs." I will leave it to readers to judge the level of profundity the application of Rand's insight to reality reveals. Chris Sciabarra has tried to dredge up the Russian influence on Rand, but little has been done to illuminate the conservative influence. Although Rand was never a conservative, she was clearly influenced by certain notions about history, philosophy, and the role of ideas in society that were commonplace among conservatives in the thirties and forties. In 1940, Rand campaigned for Wendel Wilkie. This episode in her career influenced what would later become her philosophy of history. Her frustration at trying to convince people to vote for Wilkie rather than Roosevelt convinced her of the futility of trying to reason with people. But rather than assuming that ideas and reason are impotent, Rand concluded that only political ideas were impotent, because such ideas depended on a metaphysical and epistemological foundation. This theory that political ideas and receptivity to "reason" depended on the higher branches philosophy was fairly common among conservative thinkers in the 30s and 40s. The theory was largely inspired by a misreading of George Santayana, the most important and respected conservative philosopher of the 20th century. Santayana did not care much for modern philosophy, which he regarded as dismally subjectivist. The two main strands of modern philosophy, German Idealism and British Empiricism, both regarded consciousness (or the experience of consciousness) as the starting point and main focus of philosophical investigation—the only thing "given" in man's knowledge. Santayana considered this view not only mistaken, but foolish and conceited. He had studied philosophy at Harvard, Oxford, and in Germany in the closing decades of the 19th century, when German Idealism dominated Anglo-America and German philosophy. Santayana consequently devoted much of his philosophy to criticizing and ridiculing, with his usual detached irony, all manifestions and forms of German idealism. During World War I he published an essay entitled "German Freedom," which helped popularize the thesis that Hegel's political philosophy is essentially totalitarian at its core. "For liberal freedom, for individualism, [Hegel and his followers] have a great contempt," Santayana wrote. "They say a man is nothing but the sum of his relations to other things... And they further say that a dutiful soul is right in feeling that the world it accepts and cooperates with its own work; for, according to their metaphysics, the world is only his idea which each man makes after his own image, and even as you are, so is the world you imagine you live in. Only a foolish recalcitrant person, who does not recognize the handiwork of his own spirit about him, rebels against it, and thereby cancels his natural freedom; for everywhere he finds contradictions and closed doors and irksome necessities, being divided against himself and constantly bidding his left hand undo what his right is doing. So that, paradoxical as it may seem, it is only when you conform that you are free, while if you rebel and secede you become a slave. Your spiritual servitude in such a case would only be manifesting itself in phenomenal form if the government should put you in prison." Conservatives during the 30s and 40s were not particularly sophisticated in their thinking, and so they interpreted Santayana's subtle and ironical essay on German freedom in simple cause and effect terms, as if Santayana were declaring that statism is caused by German metaphysics. Hence we find Albert Jay Nock, considered one of the leading conservative intellectuals of the thirties, declaring that Hitlerism, Bolshevism, and Fascism "are all essentially ... branches off the same tree planted by the German idealist philosophers." It is likely Rand was exposed to such notions during her involvement in the conservative movement during the forties. This idea that higher philosophy (namely, "German metaphysics") is the root cause of statism thus became embedded in her mind during her formative years. Later, she would twist this notion for her own purposes, until at last we find it springing forth in the title essay of For the New Intellectual. In her effort to rebuild philosophy anew, free from the influence of the modern post Kantian philosophy she despised, Ayn Rand chose to rehabilitate Aristotle's original methodology as the basic OS on which she was to run her shiny new Objectivism software. Aristotle, with his fundamental role in formalising logic, plus his interest in the natural world, must have seemed like the ideal partner for her ambition of healing the breach between empiricism and rationalism which had first been opened by the skeptical enquiry of David Hume. Unfortunately, Rand's decision turned out to be what I conjecture to be her most profound mistake. Rand did not realise how deeply Aristotle's method was already a part of her hated modern philosophy; how, with its emphasis on definitions and "true" meanings(what Rand called "checking your premises"), it diverted debates over real problems into fruitless arguments over mere words; arguments, as it turns out, that cannot be logically resolved. It matters not a whit whether Rand applied Aristotle's essentialism at the "epistemological" level rather than the "metaphysical" level - the logical issues are the same. The result is that her philosophy has followed the same path as those who also adopted the Aristotelian method lock stock and barrel; into unproductive scholasticism, full of sterile schisms and, despite unprecedented levels of publicity for a philosopher, a startling lack of intellectual, aesthetic, or political progression. In true scholastic fashion, this lack of progress stands in inverse proportion to the huge amount of sheer verbiage Objectivism generates. It can produce any number of works allegedly defining art - "What Art Is" - yet despite all this huffing and puffing over preliminaries, can't seem to produce much in the way of actual art. It will spend countless hours discoursing on the vital importance of epistemology to the survival of the human race; but, in 40 years, has not gone any further in developing it than Ayn Rand's "Introduction." As Karl Popper puts it, it leads to "always sharpening one's pencil, and never writing anything." Such are the hidden consequences of the Aristotelian method. The inescapable logical problems with Aristotle's definition-based methodology, and its subtly deleterious influence, are not widely discussed in general philosophical circles, and are almost completely unknown in Objectivism. Given what I view as its importance, to philosophy in general and Objectivism in particular, I present the most simple and thorough criticism of this silently destructive methodology that I know of: Karl Popper's "Two Kinds of Definition" (adapted from Chapter 11 of his brilliant "The Open Society and Its Enemies"). Enjoy. The problem of definitions and of the 'meaning of terms' is the most important source of Aristotle's regrettably still prevailing intellectual influence, of all that verbal and empty scholasticism that haunts not only the Middle Ages, but our own contemporary philosophy; for even a philosophy as recent as that of L. Wittgenstein suffers, as we shall see, from this influence. The development of thought since Aristotle could, I think, be summed up by saying that every discipline, as long as it used the Aristotelian method of definition, has remained arrested in a state of empty verbiage and barren scholasticism, and that the degree to which the various sciences have been able to make any progress depended on the degree to which they have been able to get rid of this essentialist method. (This is why so much of our 'social science' still belongs to the Middle Ages.) The discussion of this method will have to be a little abstract, owing to the fact that the problem has been so thoroughly muddled by Plato and Aristotle, whose influence has given rise to such deep-rooted prejudices that the prospect of dispelling them does not seem very bright. In spite of all that, it is perhaps not without interest to analyse the source of so much confusion and verbiage. Aristotle followed Plato in distinguishing between knowledge and opinion. Knowledge, or science, according to Aristotle, may be of two kinds - either demonstrative or intuitive. Demonstrative knowledge is also a knowledge of 'causes'. It consists of statements that can be demonstrated - the conclusions - together with their syllogistic demonstrations (which exhibit the 'causes' in their 'middle terms'). Intuitive knowledge consists in grasping the 'indivisible form' or essence or essential nature of a thing (if it is 'immediate', i.e. if its 'cause' is identical with its essential nature); it is the originative source of all science since it grasps the original basic premisses of all demonstrations. Undoubtedly, Aristotle was right when he insisted that we must not attempt to prove or demonstrate all our knowledge. Every proof must proceed from premisses; the proof as such, that is to say, the derivation from the premisses, can therefore never finally settle the truth of any conclusion, but only show that the conclusion must be true provided the premisses are true . If we were to demand that the premisses should be proved in their turn, the question of truth would only be shifted back by another step to a new set of premisses, and so on, to infinity. It was in order to avoid such an infinite regress (as the logicians say) that Aristotle taught that we must assume that there are premisses which are indubitably true, and which do not need any proof; and these he called 'basic premisses'. If we take for granted the methods by which we derive conclusions from these basic premisses, then we could say that, according to Aristotle, the whole of scientific knowledge is contained in the basic premisses, and that it would all be ours if only we could obtain an encyclopaedic list of the basic premisses. But how to obtain these basic premisses? Like Plato, Aristotle believed that we obtain all knowledge ultimately by an intuitive grasp of the essences of things. 'We can know a thing only by knowing its essence', Aristotle writes, and 'to know a thing is to know its essence'. A 'basic premiss' is, according to him, nothing but a statement describing the essence of a thing. But such a statement is just what he calls a definition. Thus all 'basic premisses of proofs' are definitions. What does a definition look like? An example of a definition would be: 'A puppy is a young dog.' The subject of such a definition sentence, the term 'puppy', is called the term to be defined (or defined term); the words 'young dog' are called the defining formula. As a rule, the defining formula is longer and more complicated than the defined term, and sometimes very much so. Aristotle considers the term to be defined as a name of the essence Of a thing, and the defining formula as the description of that essence. And he insists that the defining formula must give an exhaustive description of the essence or the essential properties of the thing in question; thus a statement like 'A puppy has four legs', although true, is not a satisfactory definition, since it does not exhaust what may be called the essence of puppiness, but holds true of a horse also; and similarly the statement 'A puppy is brown', although it may be true of some, is not true of all puppies; and it describes what is not an essential but merely an accidental property of the defined term. Now there can be little doubt that all these essentialist views stand in the strongest possible contrast to the methods of modern science. (I have the empirical sciences in mind, not perhaps pure mathematics.) First, although in science we do our best to find the truth, we are conscious of the fact that we can never be sure whether we have got it. We have learnt in the past, from many disappointments, that we must not expect finality. And we have learnt not to be disappointed any longer if our scientific theories are overthrown; for we can, in most cases, determine with great confidence which of any two theories is the better one. We can therefore know that we are making progress; and it is this knowledge that to most of us atones for the loss of the illusion of finality and certainty. In other words, we know that our scientific theories must always remain hypotheses, but that, in many important cases, we can find out whether or not a new hypothesis is superior to an old one. For if they are different, then they will lead to different predictions, which can often be tested experimentally; and on the basis of such a crucial experiment, we can sometimes find out that the new theory leads to satisfactory results where the old one breaks down. Thus we can say that in our search for truth, we have replaced scientific certainty by scientific progress. And this view of scientific method is corroborated by the development of science. For science does not develop by a gradual encyclopaedic accumulation of essential information, as Aristotle thought) but by a much more revolutionary method; it progresses by bold ideas, by the advancement of new and very strange theories (such as the theory that the earth is not flat, or that 'metrical space' is not flat), and by the overthrow of the old ones. But this view of scientific method means that in science there is no 'knowledge', in the sense in which Plato and Aristotle understood the word, in the sense which implies finality; in science, we never have sufficient reason for the belief that we have attained the truth. What we usually call 'scientific knowledge' is, as a rule, not knowledge in this sense, but rather information regarding the various competing hypotheses and the way in which they have stood up to various tests; it is, using the language of Plato and Aristotle, information concerning the latest, and the best tested, scientific 'opinion'. This view means, furthermore, that we have no proofs in science (excepting, of course, pure mathematics and logic). In the empirical sciences, which alone can furnish us with information about the world we live in, proofs do not occur, if we mean by 'proof' an argument which establishes once and for ever the truth of a theory. (What may occur, however, are refutations of scientific theories.) On the other hand, pure mathematics and logic, which permit of proofs, give us no information about the world, but only develop the means of describing it. Thus we could say (as I have pointed out elsewhere ): 'In so far as a scientific statement speaks about reality, it must be falsifiable; and in so far as it is not falsifiable, it does not speak about reality.' But although proof does not play any part in the empirical sciences, argument still does; indeed, its part is at least as important as that played by observation and experiment. The role of definitions in science, especially, is also very different from what Aristotle had in mind. Aristotle taught that in a definition we have first pointed to the essence - perhaps by naming it - and that we then describe it with the help of the defining formula; just as in an ordinary sentence like 'This puppy is brown', we first point to a certain thing by saying 'this puppy', and then describe it as 'brown'. And he taught that by thus describing the essence to which the term points which is to be defined, we determine or explain the meaning of the term also. Accordingly, the definition may at one time answer two very closely related questions. The one is 'What is it? ', for example 'What is a puppy? '; it asks what the essence is which is denoted by the defined term. The other is 'What does it mean? ', for example, 'What does "puppy" mean? '; it asks for the meaning of a term (namely, of the term that denotes the essence). In the present context, it is not necessary to distinguish between these two questions; rather, it is important to see what they have in common; and I wish, especially, to draw attention to the fact that both questions are raised by the term that stands, in the definition, on the left side and answered by the defining formula which stands on the right side. This fact characterizes the essentialist view, from which the scientific method of definition radically differs. While we may say that the essentialist interpretation reads a definition 'normally', that is to say, from the left to the right, we can say that a definition, as it is normally used in modern science, must be read back to front, or from the right to the left; for it starts with the defining formula, and asks for a short label for it. Thus the scientific view of the definition 'A puppy is a young dog' would be that it is an answer to the question 'What shall we call a young dog?' rather than an answer to the question 'What is a puppy?' (Questions like 'What is life?' or 'What is gravity?' do not play any role in science.) The scientific use of definitions, characterized by the approach 'from the right to the left', may be called its nominalist interpretation, as opposed to its Aristotelian or essentialist interpretation. In modern science, only nominalist definitions occur, that is to say, shorthand symbols or labels are introduced in order to cut a long story short. And we can at once see from this that definitions do not play any very important part in science. For shorthand symbols can always, of course, be replaced by the longer expressions, the defining formulae, for which they stand. In some cases this would make our scientific language very cumbersome; we should waste time and paper. But we should never lose the slightest piece of factual information. Our 'scientific knowledge', in the sense in which this term may be properly used, remains entirely unaffected if we eliminate all definitions; the only effect is upon our language, which would lose, not precision, but merely brevity. (This must not be taken to mean that in science there cannot be an urgent practical need for introducing definitions, for brevity's sake.) There could hardly be a greater contrast than that between this view of the part played by definitions, and Aristotle's view. For Aristotle's essentialist definitions are the principles from which all our knowledge is derived; they thus contain all our knowledge; and they serve to substitute a long formula for a short one. As opposed to this, the scientific or nominalist definitions do not contain any knowledge whatever, not even any 'opinion'; they do nothing but introduce new arbitrary shorthand labels; they cut a long story short. In practice, these labels are of the greatest usefulness. In order to see this, we only need to consider the extreme difficulties that would arise if a bacteriologist, whenever he spoke of a certain strain of bacteria, had to repeat its whole description (including the methods of dyeing, etc., by which it is distinguished from a number of similar species). And we may also understand, by a similar consideration, why it has so often been forgotten, even by scientists, that scientific definitions must be read 'from the right to the left', as explained above. For most people, when first studying a science, say bacteriology, must try to find out the meanings of all these new technical terms with which they are faced. In this way, they really learn the definition 'from the left to the right', substituting, as if it were an essentialist definition, a very long story for a very short one. But this is merely a psychological accident, and a teacher or writer of a textbook may indeed proceed quite differently; that is to say, he may introduce a technical term only after the need for it has arisen. So far I have tried to show that the scientific or nominalist use of definitions is entirely different from Aristotle's essentialist method of definitions. But it can also be shown that the essentialist view of definitions is simply untenable in itself. In order not to prolong this discussion unduly, I shall criticize two only of the essentialist doctrines; two doctrines which are of significance because some influential modern schools are still based upon them. One is the esoteric doctrine of intellectual intuition, and the other the very popular doctrine that 'we must define our terms', if we wish to be precise. The second doctrine to be criticized has even more important connections with modern views; and it bears especially upon the problem of verbalism. Since Aristotle, it has become widely known that one cannot prove all statements, and that an attempt to do so would break down because it would lead only to an infinite regression of proofs. But neither he nor, apparently, a great many modern writers seems to realize that the analogous attempt to define the meaning of all our terms must, in the same way, lead to an infinite regression of definitions. The following passage from Crossman's Plato To-day is characteristic of a view which by implication is held by many contemporary philosophers of repute, for example, by Wittgenstein: '. . . if we do not know precisely the meaning of the words we use, we cannot discuss anything profitably. Most of the futile arguments on which we all waste time are largely due to the fact that we each have our own vague meaning for the words we use and assume that our opponents are using them in the same sense. If we defined our terms to start with, we could have far more profitable discussions. Again, we have only to read the daily papers to observe that propaganda (the modern counterpart of rhetoric) depends largely for its success on confusing the meaning of the terms. If politicians were compelled by law to define any term they wished to use, they would lose most of their popular appeal, their speeches would be shorter, and many of their disagreements would be found to be purely verbal.' This passage is very characteristic of one of the prejudices which we owe to Aristotle, of the prejudice that language can be made more precise by the use of definitions. Let us consider whether this can really be done. First, we can see clearly that if 'politicians' (or anybody else) 'were compelled by law to define any term they wished to use', their speeches would not be shorter, but infinitely long. For a definition cannot establish the meaning of a term any more than a logical derivation can establish the truth of a statement; both can only shift this problem back. The derivation shifts the problem of truth back to the premises, the definition shifts the problem of meaning back to the defining terms (i.e., the terms that make up the defining formula). 14 But these, for many reasons, are likely to be just as vague and confusing as the terms we started with; and in any case, we should have to go on to define them in turn; which leads to new terms which too must be defined. And so on, to infinity. One sees that the demand that all our terms should be defined is just as untenable as the demand that all our statements should be proved. At first sight this criticism may seem unfair. It may be said that what people have in mind, if they demand definitions, is the elimination of the ambiguities so often connected with words such as 'democracy', 'liberty', 'duty', 'religion', etc. ; that it is clearly impossible to define all our terms, but possible to define some of these more dangerous terms and to leave it at that; and that the defining terms have just to be accepted, i.e., that we must stop after a step or two in order to avoid an infinite regression. This defence, however, is untenable. Admittedly, the terms mentioned are much misused. But I deny that the attempt to define them can improve matters. It can only make matters worse. That by 'defining their terms' even once, and leaving the defining terms undefined, the politicians would not be able to make their speeches shorter, is clear; for any essentialist definition, i.e. one that 'defines our terms' (as opposed to the nominalist one which introduces new technical terms), means the substitution of a long story for a short one, as we have seen. Besides, the attempt to define terms would only increase the vagueness and confusion. For since we cannot demand that all the defining terms should be defined in their turn, a clever politician or philosopher could easily satisfy the demand for definitions. If asked what he means by 'democracy', for example, he could say 'the rule of the general will' or 'the rule of the spirit of the people'; and since he has now given a definition, and so satisfied the highest standards of precision, nobody will dare to criticize him any longer. And, indeed, how could he be criticized, since the demand that 'rule' or 'people' or 'will' or 'spirit' should be defined in their turn, puts us well on the way to an infinite regression so that everybody would hesitate to raise it? But should it be raised in spite of all that, then it can be equally easily satisfied. On the other hand, a quarrel about the question whether the definition was correct, or true, can only lead to an empty controversy about words. Thus the essentialist view of definition breaks down, even if it does not, with Aristotle, attempt to establish the 'principles' of our knowledge, but only makes the apparently more modest demand that we should 'define the meaning of our terms'. But undoubtedly, the demand that we speak clearly and without ambiguity is very important, and must be satisfied. Can the nominalist view satisfy it? And can nominalism escape the infinite regression? It can. For the nominalist position there is no difficulty which corresponds to the infinite regression. As we have seen, science does not use definitions in order to determine the meaning of its terms, but only in order to introduce handy shorthand labels. And it does not depend on definitions; all definitions can be omitted without loss to the information imparted. It follows from this that in science, all the terms that are really needed must be undefined terms. How then do the sciences make sure of the meanings of their terms? Various replies to this question have been suggested, but I do not think that any of them is satisfactory. The situation seems to be this. Aristotelianism and related philosophies have told us for such a long time how important it is to get a precise knowledge of the meaning of our terms that we are all inclined to believe it. And we continue to cling to this creed in spite of the unquestionable fact that philosophy, which for twenty centuries has worried about the meaning of its terms, is not only full of verbalism but also appallingly vague and ambiguous, while a science like physics which worries hardly at all about terms and their meaning, but about facts instead, has achieved great precision. This, surely, should be taken as indicating that, under Aristotelian influence, the importance of the meaning of terms has been grossly exaggerated. But I think that it indicates even more. For not only does this concentration on the problem of meaning fail to establish precision; it is itself the main source of vagueness, ambiguity, and confusion. In science, we take care that the statements we make should never depend upon the meaning of our terms. Even where the terms are defined, we never try to derive any information from the definition, or to base any argument upon it. This is why our terms make so little trouble. We do not overburden them. We try to attach to them as little weight as possible. We do not take their 'meaning' too seriously. We are always conscious that our terms are a little vague (since we have learnt to use them only in practical applications) and we reach precision not by reducing their penumbra of vagueness, but rather by keeping well within it, by carefully phrasing our sentences in such a way that the possible shades of meaning of our terms do not matter. This is how we avoid quarrelling about words. The view that the precision of science and of scientific language depends upon the precision of its terms is certainly very plausible, but it is none the less, I believe, a mere prejudice. The precision of a language depends, rather, just upon the fact that it takes care not to burden its terms with the task of being precise. A term like 'sand-dune' or 'wind' is certainly very vague. (How many inches high must a little sand-hill be in order to be called 'sand-dune'? How quickly must the air move in order to be called 'wind'?) However, for many of the geologist's purposes, these terms are quite sufficiently precise; and for other purposes, when a higher degree of differentiation is needed, he can always say 'dunes between 4 and 30 feet high' or 'wind of a velocity of between 20 and 40 miles an hour'. And the position in the more exact sciences is analogous. In physical measurements, for instance, we always take care to consider the range within which there may be an error; and precision does not consist in trying to reduce this range to nothing, or in pretending that there is no such range, but rather in its explicit recognition. Even where a term has made trouble, as for instance the term 'simultaneity' in physics, it was not because its meaning was imprecise or ambiguous, but rather because of some intuitive theory which induced us to burden the term with too much meaning, or with too 'precise' a meaning, rather than with too little. What Einstein found in his analysis of simultaneity was that, when speaking of simultaneous events, physicists made a false assumption which would have been unchallengeable were there signals of infinite velocity. The fault was not that they did not mean anything, or that their meaning was ambiguous, or the term not precise enough; what Einstein found was, rather, that the elimination of a theoretical assumption, unnoticed so far because of its intuitive self-evidence, was able to remove a difficulty which had arisen in science. Accordingly, he was not really concerned with a question of the meaning of a term, but rather with the truth of a theory. It is very unlikely that it would have led to much if someone had started, apart from a definite physical problem, to improve the concept of simultaneity by analysing its 'essential] meaning', or even by analysing what physicists 'really mean' when they speak of simultaneity. I think we can learn from this example that we should not attempt to cross our bridges before we come to them. And I also think that the preoccupation with questions concerning the meaning of terms, such as their vagueness or their ambiguity, can certainly not be justified by an appeal to Einstein's example. Such a preoccupation rests, rather, on the assumption that much depends upon the meaning of our terms, and that we operate with this meaning; and therefore it must lead to verbalism and scholasticism. From this point of view, we may criticize a doctrine like that of Wittgenstein, who holds that while science investigates matters of fact, it is the business of philosophy to clarify the meaning of terms, thereby purging our language, and eliminating linguistic puzzles. It is characteristic of the views of this school that they do not lead to any chain of argument that could be rationally criticized; the school therefore addresses its subtle analyses exclusively to the small esoteric circle of the initiated. This seems to suggest that any preoccupation with meaning tends to lead to that result which is so typical of Aristotelianism: scholasticism and mysticism. A similar result was produced by Aristotle's doctrine of definition. First it led to a good deal of hairsplitting. But later, philosophers began to feel that one cannot argue about definitions. In this way, essentialism not only encouraged verbalism, but it also led to the disillusionment with argument, that is, with reason. Scholasticism and mysticism and despair in reason, these are the unavoidable results of the essentialism of Plato and Aristotle. And Plato's open revolt against freedom becomes, with Aristotle, a secret revolt against reason. As we know from Aristotle himself, essentialism and the theory of definition met with strong opposition when they were first proposed, especially from Socrates's old companion Antisthenes, whose criticism seems to have been most sensible. But this opposition was unfortunately defeated. The consequences of this defeat for the intellectual development of mankind can hardly be overrated. In the next issue of the Journal of Ayn Rand Studies, there will be a symposium of sorts discussing the relation between Rand and Nietzsche. During the sixties and seventies, Rand was often accused of being indebted to Nietzsche. One critic went so far as to describe Rand's philosophy as little more than a mixture of Nietzsche and Adam Smith. The motivation behind the linkage of these two literary philosophers is twofold: first, to undermine Rand's claim to originality by suggesting that Rand got all her individualistic notions straight from Nietzsche; and second, to undermine Rand's credibility by associating her with a philosopher who at one time was linked to Hitler and the Nazis. My own position is that Rand's mature thought is not in any significant way influenced by Nietzsche. Not only is her ideal of man very different from Nietzsche's, but so is her individualism. Nietzsche believed that great men are forged in the crucible of brutal myths (e.g., the myth of eternal recurrence) and harsh adversity ("what doesn't kill us outright makes us stronger"). Rand believed that rational thinking, when zealously followed, lead to the complete integration of emotion and thought, which formed for her the bedrock of human greatness. Nietzsche identified freedom with the battle for freedom; Rand with the attainment of free market individualism. Nietzsche believed in the inevitability of conflict; Rand argued that no conflict was even possible between rational men. Nietzsche equated skepticism with honesty and regarded convictions with immense suspicion; Rand equated even the mildest forms of skepticism with a concerted attempt to undermine man's cognitive faculty. Nietzsche contended that nearly everything men believed were lies, but that some of these lies were psychologically or socially useful; Rand insisted that all lies are bad and that no good can come from believing something that is not true. Rand's other major complaint against Nietzsche is that he disowned reason in his book The Birth of Tragedy. If Rand had bothered to read the preface of that book, she might have realized that the work is not representative of Nietzsche's mature thought, that he turned against the sort of romantic Wagnerism expressed in its pages and became much more sympathetic to science and even "reason." Now if Rand didn't even understand Nietzsche, how on earth could she have been influenced by him? Perhaps a case could be made that she was influenced by what she read into Nietzsche; but she was hardly influenced by what Nietzsche actually wrote and meant.